Step out of the office and into the spotlight- Take the Shakespeare Challenge! Have an inner flair for the dramatic? Ever wanted to perform Shakespeare on stage? Here’s your opportunity! We are calling on all professionals with the desire to make a difference in the lives of at-risk youth! 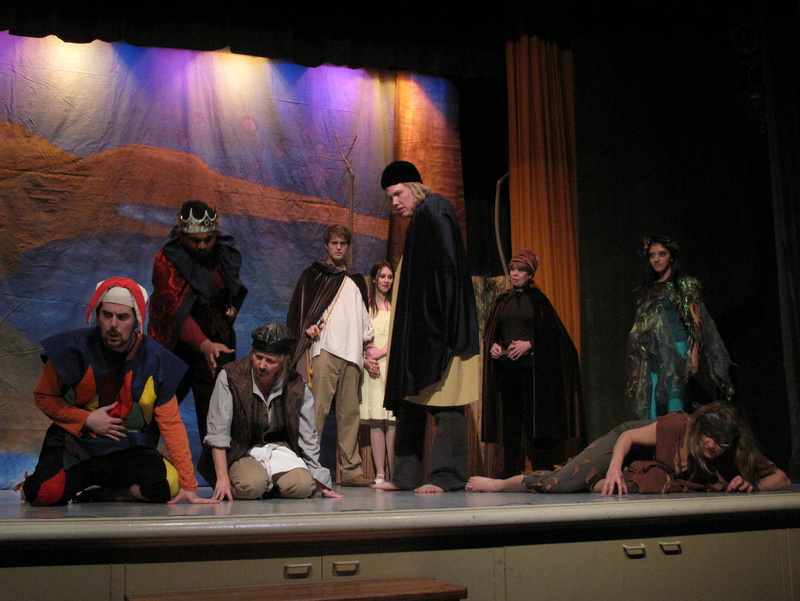 The Shakespeare Challenge is an annual fundraiser, where community members from all walks of life (no acting experience required) come together to rehearse an abridged version of a Shakespeare play to raise funds for Shakespeare in Action’s educational programming! Two past Shakespeare Challenge champions share their experience participating in the fundraiser, and why you should get involved! Visit www.shakespeareinaction.org/shakespeare-challenge for more info! Registration for the 5th Annual Shakespeare Challenge is Officially OPEN! CALLING ALL PROFESSIONALS with the desire to make a difference in the lives of at-risk youth! Toronto, the city of work – Toronto, take a break and play! Step out of your Winter routine and into the spotlight this Spring, and join the cast of Shakespeare in Action’s 5th annual Shakespeare Challenge! For the past four years, community members from the corporate sector fearlessly took to the stage in productions of some of William Shakespeare’s most popular plays to raise funds for Shakespeare In Action’s educational programming. Their generosity has helped to foster literacy, enhance creativity and promote speech arts for youth at risk in Toronto’s priority neighborhoods. In celebration of the 5th Shakespeare Challenge, this year we are looking for a group of 14 courageous community members to volunteer their time to rehearse and perform an abridged version of one of Shakespeare’s beloved comedies, chosen between A Midsummer Night’s Dream, Much Ado About Nothing,and As You Like It, at the Historic Arts and Letters Club of Toronto. 8 rehearsals, a small amount time. Tuesday’s only from 6:30pm – 9:30pm, January 12th– April 5th, 2016. 8 tickets, sold for $75 each to friends, family members, and colleagues to the final show. Be professionally coached and directed by our renowned Artistic Director, Michael Kelly. Socialize & meet new friends that help to create an exciting community event that supports youth. 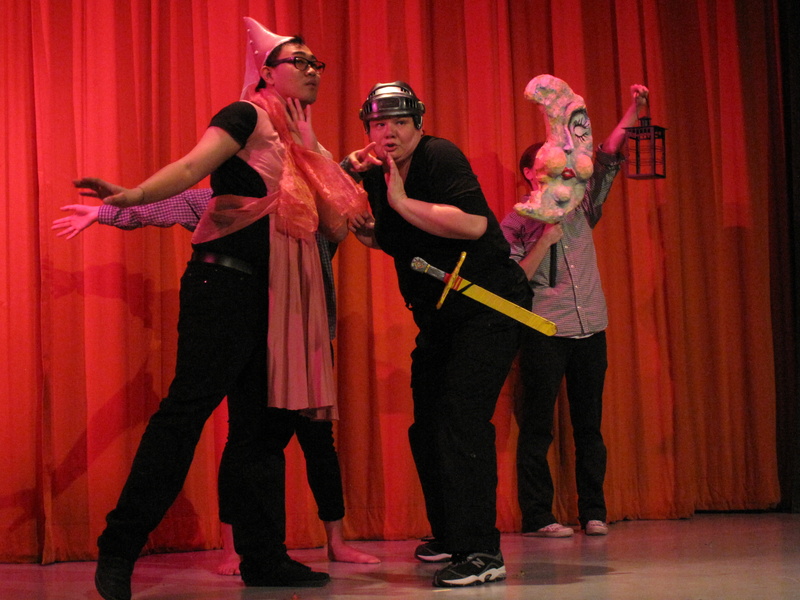 Ensure youth from priority neighbourhoods get access to professional theatre arts programming. 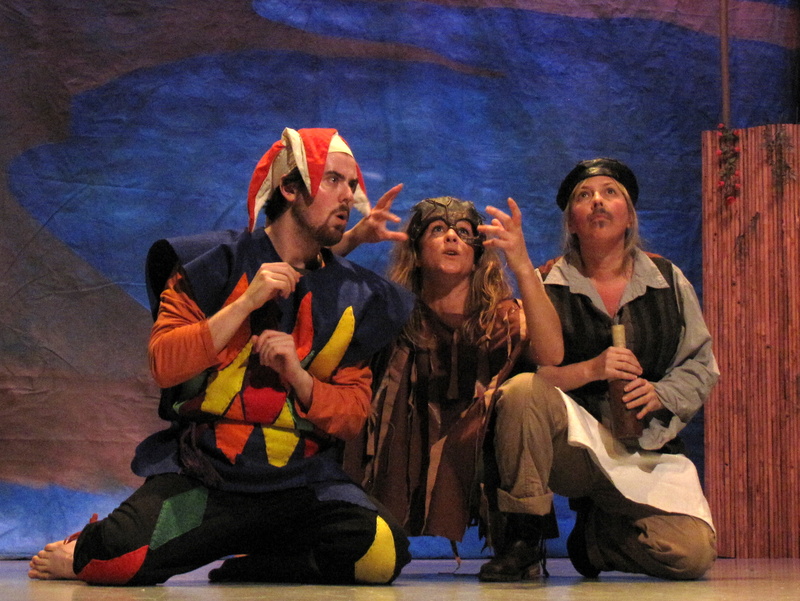 Make a commitment to have fun, exercise your inner actor and enjoy the magic of Shakespeare. Upon registration, each champion will make a tax deductible deposit of $100.00, and will commit to attending scheduled rehearsals, and selling a minimum of 8 tickets to the final performance on April 6, 2015. To register, click on the Register Now button below! The deadline to register is December 18, 2015. Participants must be at least 18 years old. For more information on rehearsals and other ways to get involved, please visit our website! 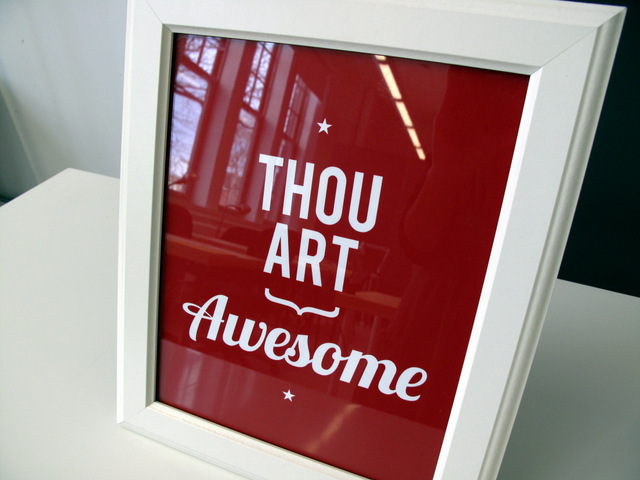 The Shakespeare Challenge- Check out our live auction packages! There are only a few days left until the Shakespeare Challenge fundraising gala, and the SIA team, along with our Challenge Champions are putting the final touches on The Comedy of Errors, as well as the live and silent auction! Here is a sneak peak at what guests will be able to bid on in the live auction right after the show! Montreal Trip– Take a round trip for 2 to Montreal, courtesy of VIA Rail to attend the Talk of the Fest Show from July 20-26 at the Just for Laughs Festival! Enjoy accommodations for one night provided by Delta Downtown Montreal, and brunch provided by Vieux-Port Steakhouse. Cottage Stay– Spend 2 nights at a beautiful 2 bedroom cottage overlooking Lake Erie. Valid from October- November for a perfect Fall getaway! Oakdale Golf and Country Club- Enjoy a round of golf for 4 at the Oakdale Golf and Country Club in Toronto! Valid until Dec. 31, 2015. *Please note that a $60 host caddy fee is also required. Niagara-on-the-Lake Experience- Spend 2 nights at Aqua Bella B&B, and enjoy 2 tickets to a Shaw Festival Show. Complete your trip with a romantic wine tasting experience for 2 at Chateau des Charmes in Niagara-on-the-Lake. Stratford Festival Stay- Spend the night at Caledonia House, and see a show at the Stratford Festival during the 2015 season. Winners will also be treated to a complimentary tour of the Festival’s props and costumes warehouse! Whole Beast Butchery Demo- Learn how to expertly cut your meats with a butchering class demonstration for 8 people at Sanagan’s Meat Locker. The silent auction will have many more amazing packages to bid on! To join us for the Shakespeare Challenge, please visit our website to purchase tickets! Win Tickets to the 4th annual Shakespeare Challenge! Shakespeare in Action is holding the 4th annual Shakespeare Challenge fundraising gala on March 25, 2015 at The Arts and Letters Club of Toronto, and we want you to join us! For the past three years, community members from the corporate sector fearlessly took to the stage in productions of William Shakespeare’s A Midsummer Night’s Dream, The Tempest, and Twelfth Night to raise funds for Shakespeare In Action’s educational programming. Their generosity has helped to foster literacy, enhance creativity and promote speech arts for youth at risk in Toronto’s priority neighborhoods. This year, The Challenge will feature twelve community members coming together to unleash their inner Shakespeare under the direction of Shakespeare in Action’s renowned Artistic Director Michael Kelly. 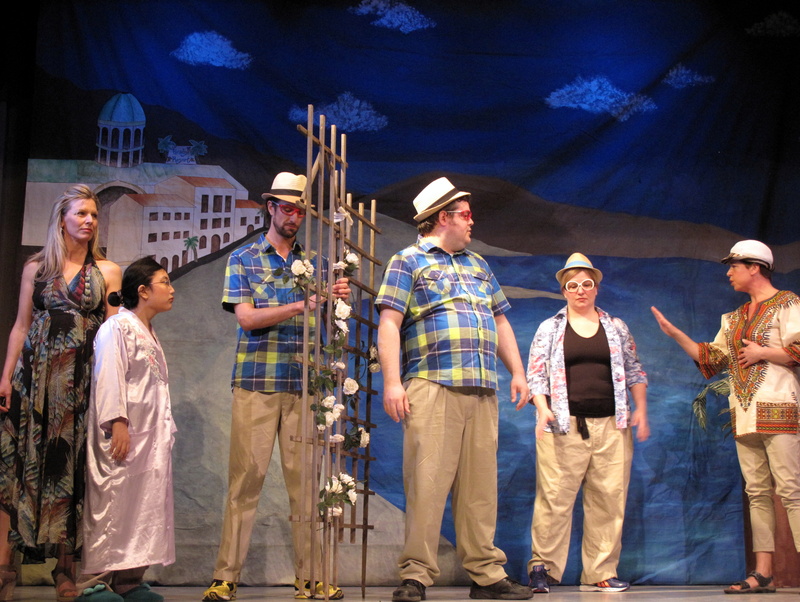 Our Challenge Champions will perform an abridged version of The Comedy of Errors. In a race against time, these brave souls have rehearsed one night a week for eight weeks to prepare and present this memorable production. That’s the Shakespeare Challenge! We are giving away a pair of tickets to the Shakespeare Challenge, where guests will be treated to a performance of The Comedy of Errors, food and drink, and a live and silent auction with fabulous packages, including a trip for 2 to Montreal to attend a Just For Laughs event, wine tasting tours, golfing passes, theatre tickets, and many more! Most importantly, all funds raised will go towards Shakespeare in Action’s educational programming, giving access to the arts to students in priority neighbourhoods across Toronto! To enter, all you have to do is send an e-mail to jenny@shakespeareinaction.org with your name and contact information, and tell me who your favourite character from The Comedy of Errors is! Contest closes at 11:59PM on Friday, March 20, 2015. Winner will be selected at random and contacted via phone or email. WANTED- Volunteer Piano Player and Auctioneer for the Shakespeare Challenge Fundraising Gala! Shakespeare in Action is looking for a volunteer piano player and a volunteer auctioneer for the 4th annual Shakespeare Challenge fundraising gala on March 25, 2015. The event will take place at The Arts and Letters Club of Toronto, located at 14 Elm Street, near Yonge and Dundas. We are looking for an individual to play pleasant and lively music to entertain guests during the reception. The event begins at 7:00PM, and will be over by 10:30 at the latest, with a break in the middle to enjoy the performance and live auction. We can offer a small stipend for the evening, but this will be a volunteer position. Our volunteer auctioneer will be responsible for running the live auction that will take place right after the show has finished. The live auction should last for about 20 minutes total, and will include under 10 packages. You will be invited to join us beforehand to enjoy the show, as well as the reception right after the live auction has been completed. If you are interested in volunteering for the evening with us, please contact Michael Kelly at info@shakespeareinaction.org, or (416) 703-4881. 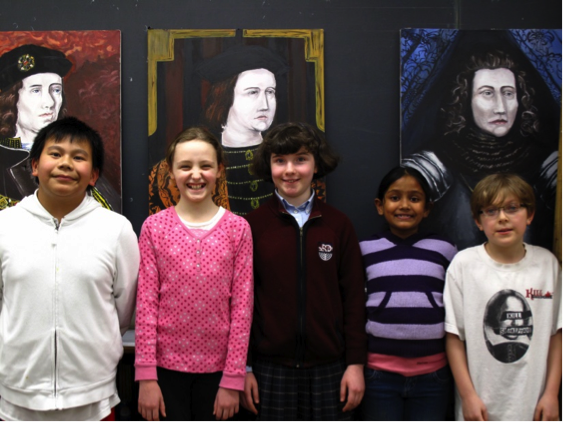 February was a short but busy month for us at Shakespeare in Action, as it marked our 5th annual Sonnets by Kids for Valentine’s Day fundraiser! 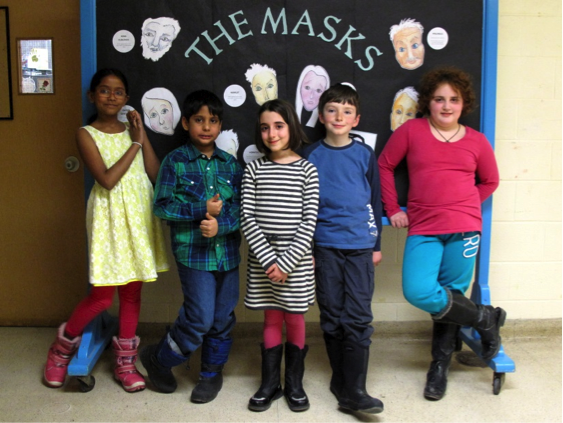 Sonnet Kids – Dushane, Ivy, Nicholas, Saskia, and Thomas – all began their journeys in different places – our Summer Camp for Kids and the TD Shakespeare for Kids Library Club sessions at Brookbanks, Highland Creek, Main Street, and St. Jamestown public libraries. 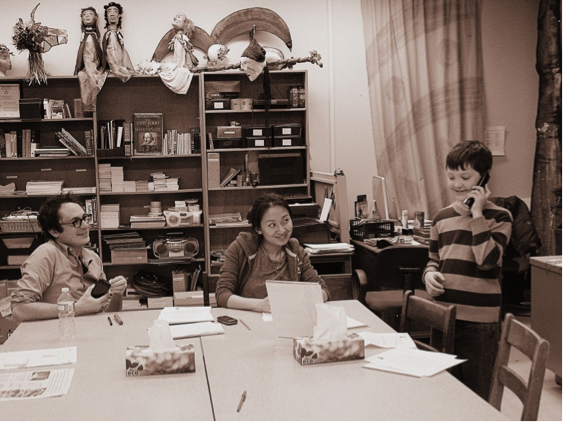 We spent time together unpacking sonnets 18, 29, 105, and 116 – discovering rhyme scheme, sorting out characters’ thoughts and feelings, and using the hundred-odd words that the kids recognized to decode the half dozen words that they had never seen before. 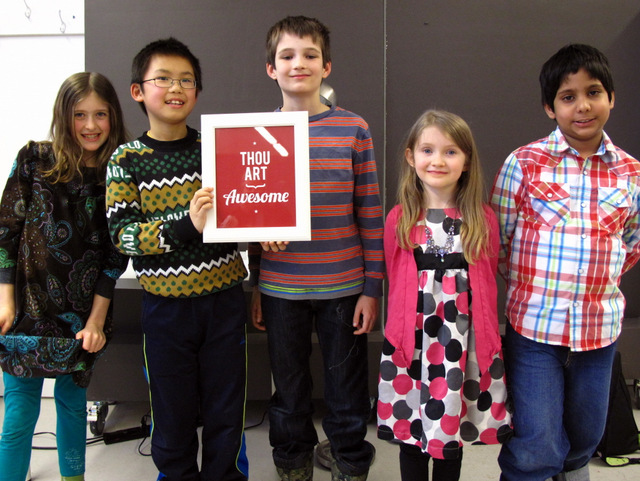 On Valentine’s Day, they were ready to deliver sonnet-grams to unsuspecting recipients in Canada and the US! Thank you: To all the parents and guardians for their time and encouragement; to CBC Metro Morning for showcasing this program and helping us reach a new audience; to Pizzaville (College and Roxton), Metro (College and Shaw), and our favourite bookstore, Doug Miller Books (now at 650 Bloor Street West!) for adding the gift of great food and reads to our festivities; and to everyone who purchased a sonnet for a loved one, in support of literacy and live theatre! 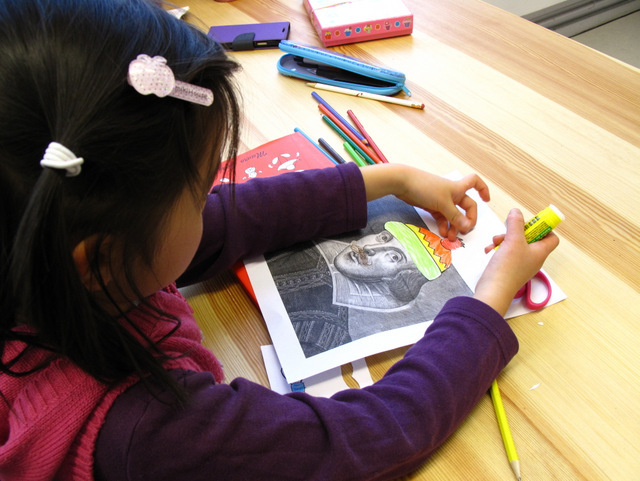 A warm thank-you to everyone who supported Sonnets by Kids for Valentine’s Day! 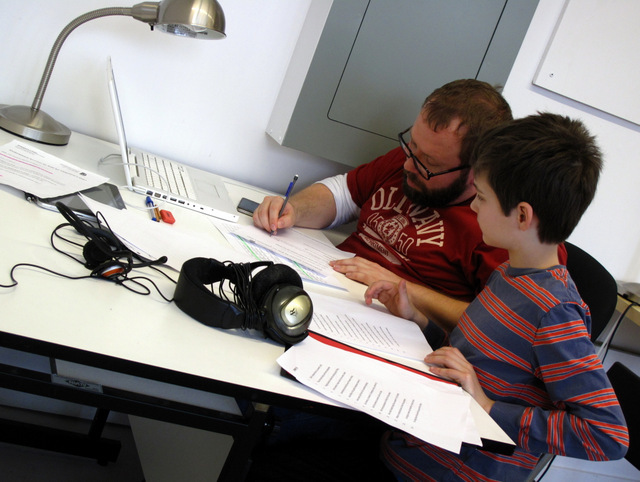 Sonnet Buddy, Kyle and Sonnet Kid, Thomas, prepare for one of the first calls! 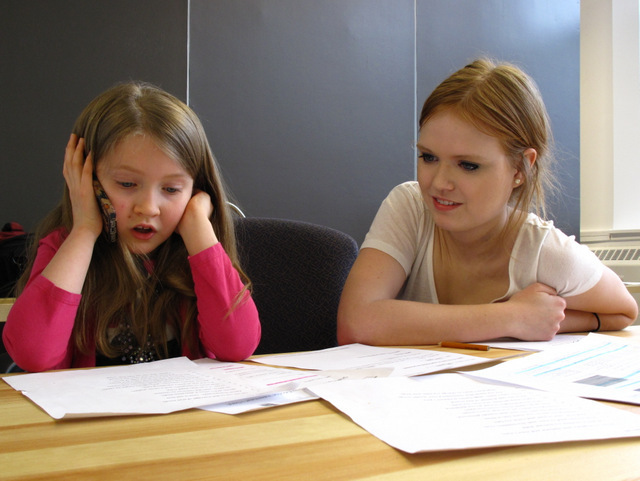 Ivy delivers a sonnet, while Sonnet Buddy, Anna, looks on. Sonnet Buddy, Asha, lends a hand as Nicholas signs off on a sonnet. 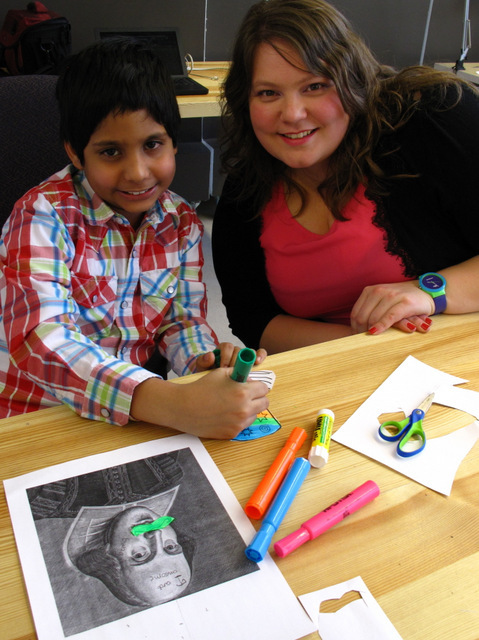 Sonnet Kid, Dushane, with Sonnet Buddy, Jenny! Sonnet Kid, Saskia, and Sonnet Buddy, Rebecca! And, wait, who’s that in the middle? Our amazing Sonnet Kids! L-R: Saskia, Nicholas, Thomas, Ivy, and Dushane. With the Sonnet Buddies! Back Row, L-R: Rebecca, Asha, Kyle, Anna, and Jenny! Sonnets-by-Kids – A Unique Gift for Valentine’s Day! 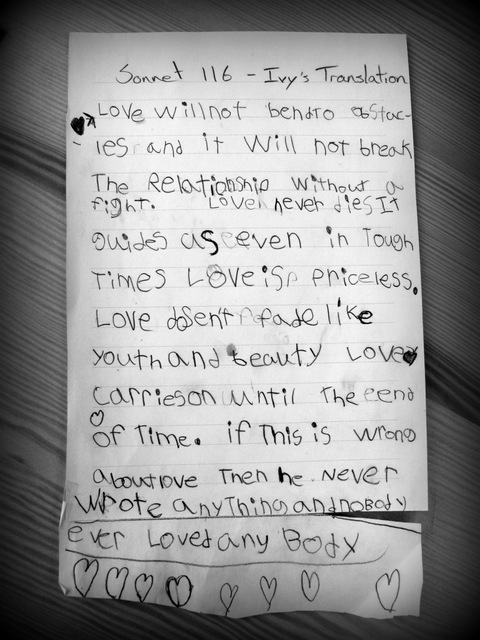 Sonnets by Kids for Valentine’s Day is celebrating its 5th year! This Valentine’s Day, why not give the gift of poetry and let the Bard do the talking! 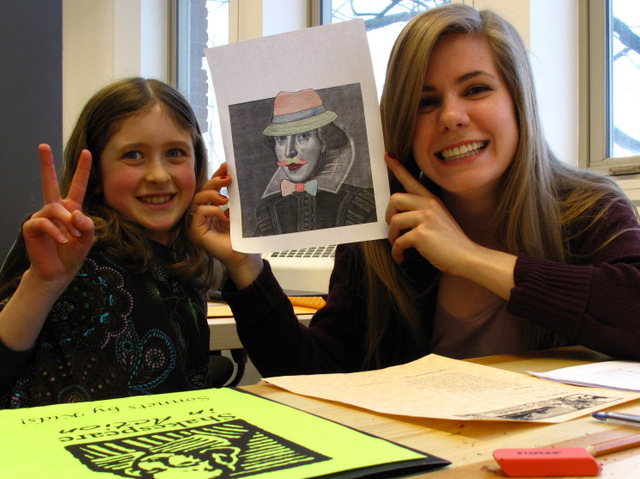 On Valentine’s Day, between 2:30pm and 4:30pm EST, a talented and charming Shakespeare Kid will call your lucky Valentine and recite the sonnet with a heart full of love! A Shakespeare Kid will also sign and mail a personalized copy of the sonnet for your Valentine! SONNETS BY KIDS are available in Canada and the US until Friday, February 13, 2015 at 5pm EST, while quantities last. 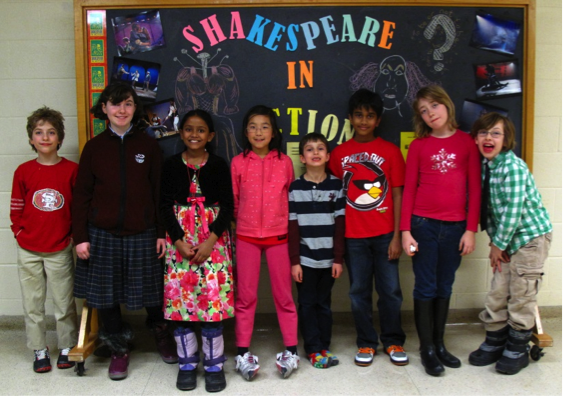 Shakespeare in Action is a not-for-profit organization, dedicated to introducing young people to the magic of Shakespeare, language and live theatre. 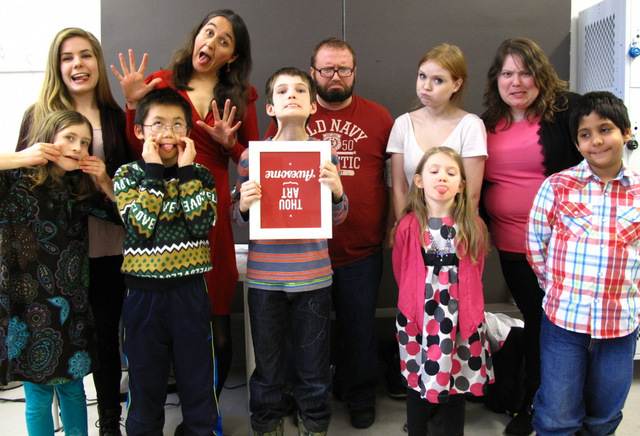 All proceeds support our educational programs throughout Toronto – the kids are “graduates”!